The Radeon RX 590 is the latest and greatest mainstream graphics card from AMD and is targeted at targeted to 1080P gamers that want to play every game on the market today at respectable frame rates for under $300. You also get three PC games for free when you purchase the RX 590 (Devil May Cry 5, The Division 2, and Resident Evil 2) to help sweeten the deal. 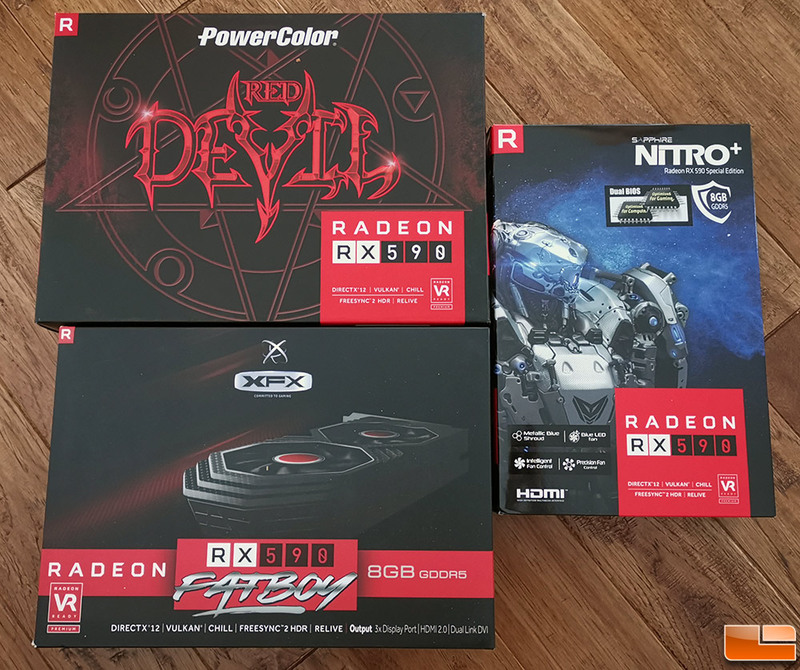 In our launch day review we looked at the XFX Radeon RX 590 Fatboy and have since gotten in the PowerColor Red Devil AXRX 590 as well as the Sapphire Nitro+ Radeon RX 590 Special Edition. 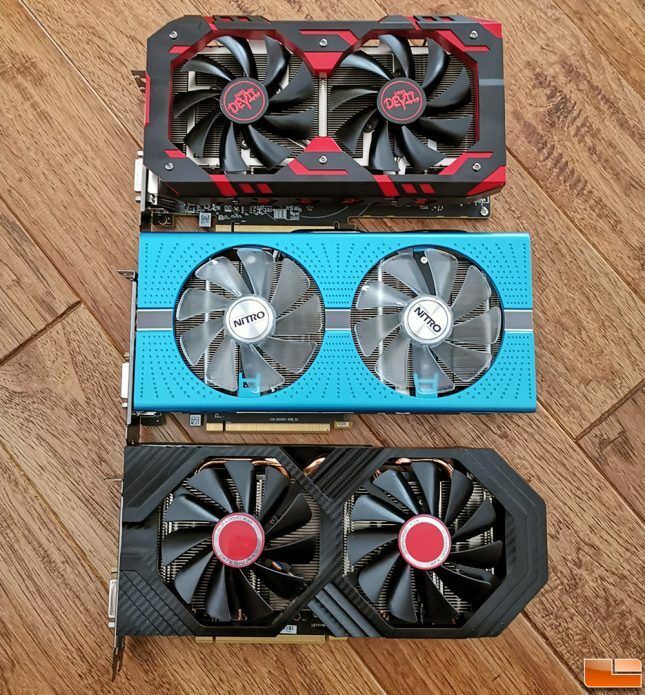 Today we’ll be doing a quick round-up style review of all three cards at once with the goal of helping someone looking to purchase a Radeon RX 590 to get the best one possible. We put together a specifications table to better show off the major differences between these three models. 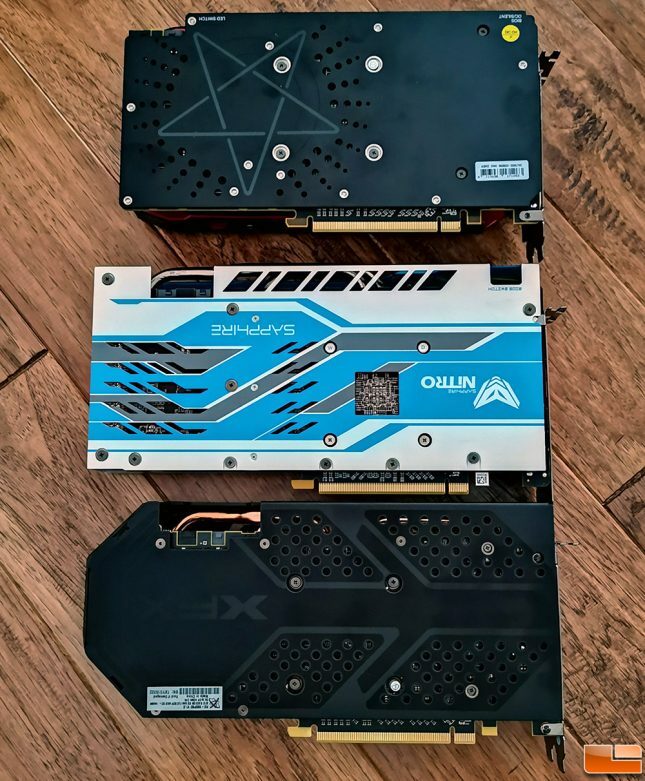 All three of these cads are very similar to one another and that is expected since they are Radeon RX 590 cards. We are a little shocked to find that these cards core clocks differ by just 4MHz to 20MHz. Ironically the card with the lowest core clock speed, the Sapphire Nitro+ Radeon RX 590 Special Edition, costs $39 more than the other two cards. 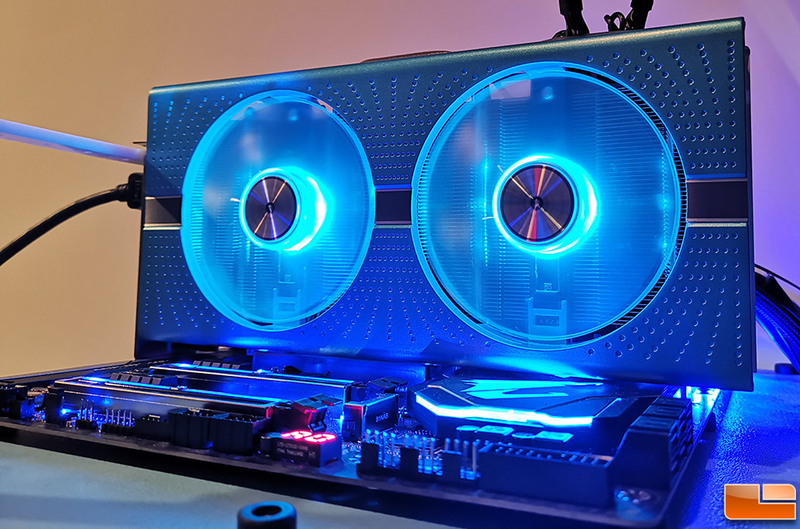 Sapphire was the only card in our roundup to overclock the 8GB of GDDR5 memory though, so it will be interesting to see who comes out ahead in the benchmarks. All of these cards have dual 95mm axial fans and similar designed GPU coolers. All of the cards also have 6+1 power phase board designs and one 6-Pin and one 8-Pin PCI Express Power connectors. 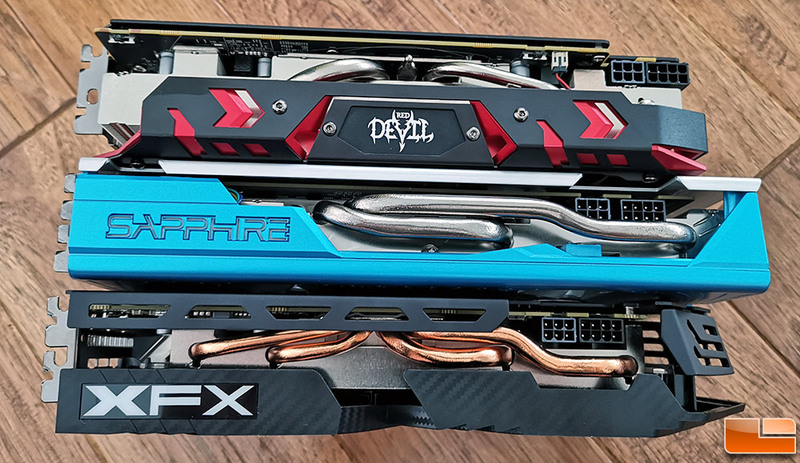 We tossed each of the cards on our shipping scale and found that the PowerColor Red Devil RX 590 weighed the most at 2 pounds 7.2 ounces despite being the shorted in length. That is more than half a pound heavier than XFX Radeon RX 590 Fatboy! All three cards have plastic fan shrouds, so that extra weight is mainly from the GPU heatsink. The only true dual-slot card is the Sapphire Nitro+ Radeon RX 590 Sepcial Edition as the PowerColor and XFX cards are considered 2.2 and 2.5-slot cards. XFX and Power color went with the traditional black and red color scheme, while Sapphire went with a blue fan shroud with clear LED fans. All three models have black PCBs. It should be noted that Sapphire is the only company to use quick connect fans, so their is just one screw and no fan header to remove when swapping fans. This makes fan replacement much easier down the road as their is just one screw to remove and you can pop in a new fan. The XFX and PowerColor fans are held in with three screws and the wire is routed to the cards main PCB. This means you’ll have to remove the entire fan shroud to route the fan header. All three models have one 6-Pin and one 8-Pin PCI Express Power connector along the top edge of the board. All of the cards also feature a dual-BIOS design and each has a DIP switch along the top edge to change between them. PowerColor provides a second DIP switch along the top edge that disables the LED lights if so desired. Each of these models appear to have a 1.5mm thick backplate to help protect the board and allow for enhanced heat dissipation. 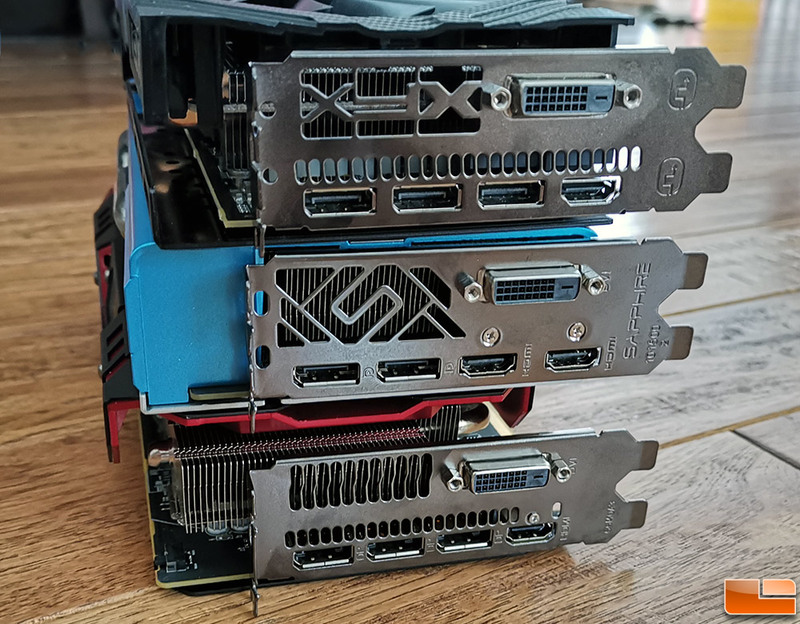 XFX and PowerColor went with three DisplayPort, one DVI-D, and one HDMI 2.0 connectors when it came to video outputs on their Radeon RX 590 cards. Sapphire switched it up a bit and went with two DisplayPort, one DVI-D, and twoHDMI 2.0 connectors. All of the cards have LED lights, but the card with the most is the Sapphire Nitro+ RX 590 Special Edition. The front axial fans have blue LED lights and the Sapphire name plate on top of the card are LED backlit and changes color to indicate board temperature.